We have made good progress on our fundraiser for 2016-2017. Many of you have already donated and we are truly appreciative. Our goal was to raise $9,500 during year-end, and we are getting so close to meeting that goal! 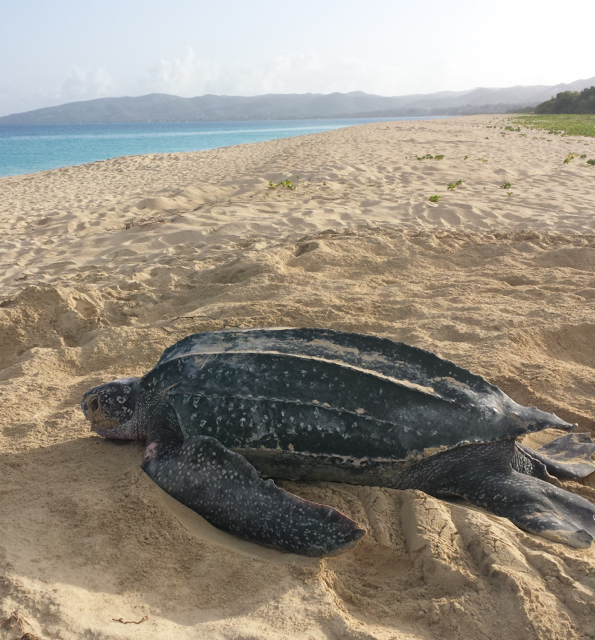 Volunteers and Students – Each summer we support over 15 volunteers and students who donate their time and energy to help protect the endangered leatherbacks of Sandy Point, in St. Croix. We would like to provide food and partial travel expenses for these volunteers who have often used their own funds to travel to St. Croix in the past. Our project would not be as seamless and successful without their participation. We rely on them tremendously, particularly during hatchling season when there are many nests to protect as the hatchlings are emerging from the sand. Housing – Our home base for volunteers and students is at Cottages by the Sea. We have been working with Cottages for many years to have a good place to call home that is close to the nesting beaches and they do a great job in supporting our many visitors and volunteers. We would like to help defray the cost of housing for students and volunteers to make their personal expenses a little less. Volunteer Coordinator – our volunteer coordinator is a critical part of our team and manages aspects of daily life in the field. They schedule volunteers to help with night patrols, and with nest protection outings as well. They coordinate all visitors and students who come to help or study the turtles. The volunteer coordinator will also lead weekly free public lectures on global sea turtle biology and conservation. We would like to support our volunteer coordinator with expenses related to travel and subsistence while stationed with us. Graduate student volunteer Shreya excavates a nest after it hatched to evaluate nest success. It’s a tough job! She’s been smiling through it for two nesting seasons! Did you catch us on #SeaofHope last night?